Have you ever applied a liquid weed control just as the label recommended and not see the results that were advertised? Or felt that you pretty much always have to reapply a second time to get the results you were hoping for the first time? There are many factors that go into how well a lawn and garden weed, insect, or disease control is going to work including the temperatures, rainfall and moisture, the time of the year, as well as the extent of the problem. Increase the effectiveness of your lawn and garden chemicals with Bonide’s Turbo spreader sticker. I have just recently started to us this product, and absolutely love the response that I have received. The past two summers, I have been battling with lawn weeds, particularly the small-leafed clover and creeping charlie (ground ivy). I used spray weed controls with some success but I always felt that it was a battle that I was never quite winning. This year, I decided to use Bonide’s Turbo spreader sticker – what did I have to lose? To my amazement, the results have been noticeable and far more effective! To exaggerate its effectiveness, an unexpected rainstorm came about 30 minutes after my most recent application. Ortho’s chickweed, oxalis, clover killer (for small and tough lawn weeds) recommends that you allow 2 hours for the product to dry before watering the lawn. As soon as the rain came, I immediately felt that all my work would have to be repeated, but I decided to give it about a week to see what would happen. The results were the best that I had ever experienced! There were only a few areas that I will need to touch up, which is quite amazing figuring the short time the weed control had to work its way into the plant tissues! How it works: Bonide’s Turbo spreader sticker is a biodegradable spreading/sticking/penetrating agent that provides better distribution and adhesion of all lawn and garden insecticides, herbicides, and fungicides in liquid form. Turbo helps the chemicals spread out evenly over the plant leaves and absorb quicker. By adding Turbo to your lawn and garden chemicals, you will increase effectiveness, reduce your usage, and save you time and money! Turbo can be added to any liquid concentrate with ease, including wettable powders. Simply add your pump sprayer before adding the water to dilute. If you typically use ready-to-use chemicals, you can add just a touch to the bottle and agitate lightly by tipping the bottle back and forth a number of times. This will allow the Turbo to work its way through the premixed solution. 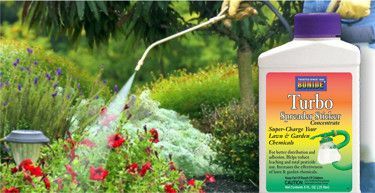 Despite its many uses, it is not recommended to use with deer repellents and liquid fertilizers, but it is great for almost everything else!